On Friday morning at a not-so-early hour, the three of headed back to the power station at Bridal Veil Falls, this time to do some hiking in Bridal Veil Basin upstream from the famous falls and historic power plant located there. Eric and Steve planned to do an easier hike up to Blue Lake on the east side of the basin while I wanted to tag three of the peaks from the Seven Summits Trail found on the west side. The road to the power station is gated closed, but foot traffic is allowed through a convenient hole in the gate leading into the basin. We hiked for well more than an hour up the old mining road following along the east side of Bridal Veil Creek. A few vehicles passed us by during this time. Apparently they are doing some work on a water diversion tunnel near Blue Lake that supplies much of Telluride's water. At around 11,500ft we reached the junction for Blue Lake and parted ways. I followed the road southwards along the main branch of the creek for another half hour until above 12,000ft. Here I left the road, crossed the creek to the west side, and began the long ascent up the east slopes of La Junta Peak. Though steep and featuring some modest cliff bands, much of the mountain is blanketed in greenery with fairly easy cross-country travel. Some verdant chutes made nice paths through the cliff bands on this side. A couple of marmots watched me in my efforts before taking cover, in contrast to a buck grazing upslope that hardly bothered to look back over its shoulder before taking off. Near the summit I came across a mother hen, a ptarmigan I think, with half a dozen small chicks she was trying to shepherd away from my approach. She didn't stand much of a chance as they were somewhat scattered and far slower than even my uphill pace, but luckily for her I wasn't there to eat her brood (now I know why I saw a fox at 13,000ft a few days earlier) but merely observe them. It was noon before I reached the summit about 2.5hrs after starting out, no record ascent time, to be sure. The sky was overcast though no rain was currently threatening - that would come later. There is a fine view of upper Bridal Veil Basin and a handful of 13ers to the SE that would make for a few more nice days of peakbagging (those would have to wait for another trip). To the south rises the 13,500ft+ summit of Wasatch Mtn which I had visited a few days earlier. 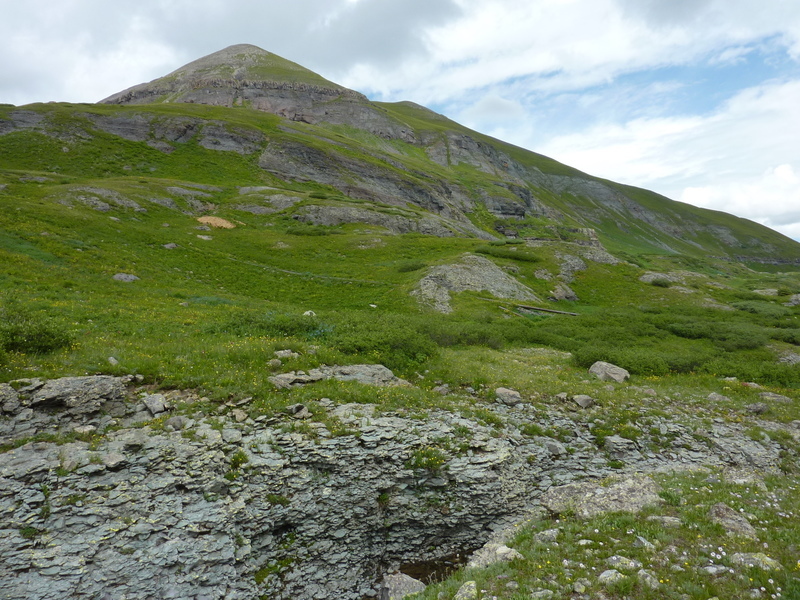 Between them is a saddle separating Bridal Veil Basin from La Junta Basin to the west. Looking north, I was happy to see that the ridgeline extending across No Name Peak to Ballard Mtn looked like a most pleasant stroll, much as it had appeared on the maps I perused beforehand. It took less than half an hour to reach No Name Peak along the ridgeline separating La Junta and Jackass Basins. From the summit of No Name I could see several folks standing and sitting atop Ballard Mtn another 2/5mi further north. I made swift time getting over there so I could meet up before they headed down - I really didn't expect to see any others on what I thought were some obscure summits. They were a friendly enough group, particularly the gentleman I asked about descending into Silver Lake Basin to find my way back down to Bridal Veil Basin and the TH. He was very knowledgeable about the area and pointed to a few other trails that could be seen to the north. He showed me a trail map he carried with him titled, Telluride's Best Hiking and Biking Trails, surprised that I knew nothing about it. 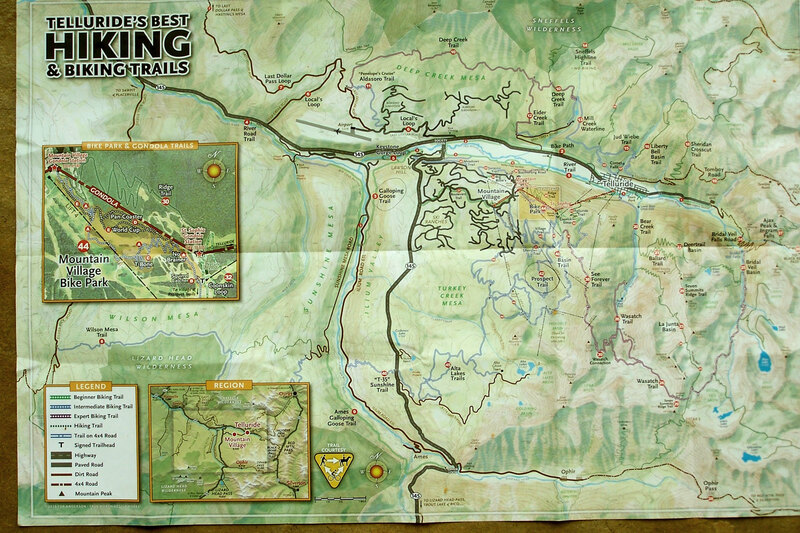 It was a gem of a map, showing some of the informal trails not found on the topo map or other area hiking guides. In particular it showed the La Junta Trail which I had stumbled upon a few days earlier, and showed some additional trails heading north off Ballard Mtn. When I asked if I could take a picture of his map for reference, he kindly offered to let me keep it for which I thanked him greatly. Armed with new info, I decided to change plans. I had told Steve and Eric what time they might expect me back at the power station, but not to wait if I was late in getting there. So it wasn't really necessary that I return that way. Heading north off Ballard, the map showed several trails dropping west to Bear Creek which would get me back to Telluride more directly and let me explore these new trails. After dropping down 1,000ft along the North Ridge from Ballard's summit, I found the unsigned fork with the Ballard Trail that drops west off the ridge, descending another 2,500ft in a long series of switchbacks through forested terrain. Upon reaching the bottom of the canyon I found there were even more trails than were shown on the map. The map shows the Ballard Trail crossing the creek to join the Bear Creek Trail on the west side, but another fork continues on the east side, a much narrower and more private affair that I found quite enjoyable. It eventually joins an old road on the south side of the San Miguel River which I followed back through Town Park just outside the venue for the Telluride Jazz Festival that was getting under way. It was nearly 3p by the time I got back to the Telluride Hotel where I once again met up with Steve and Eric. They were planning to attend the jazz festival while I had declined (I thought the music too noisy even from where I passed by at a distance). We had dinner at the Cosmopolitan where Steve and Eric and already dined a previous night. Between 6-7p the sushi appetizers are half-priced (which makes over-priced sushi more reasonably so) and we made dinner out of sampling all of these. We had arrived half-drenched when the skies had opened up to begin storming on our walk over. It came down in buckets for a time while we were inside eating. We could see cold and soaked festival-goers returning from the park, giving up on the venue after trying to make it work. Steve and Eric hadn't even gone yet, but I was already feeling better about my decision not to join them. They gave it a good effort after dinner, finding a tarp to let them stay somewhat dry, but they, too returned before too long, reporting only a handful of die-hards having stuck it in the continuing rain. Afternoon thunderstorms meet outdoor festivals - guess which wins?